For those of you not aware, DragonChain is the hottest coin around. It was originally developed at Disney’s Seattle office in 2015 and 2016 as the Disney Private Blockchain Platform and it has recently launched on Kucoin exchange in china. As far as I know you can't really find DragonChain in any of the major exchanges yet. You can check the [White Paper] (https://dragonchain.com/assets/Dragonchain_Business_Summary.pdf) > here and do your own research about it. 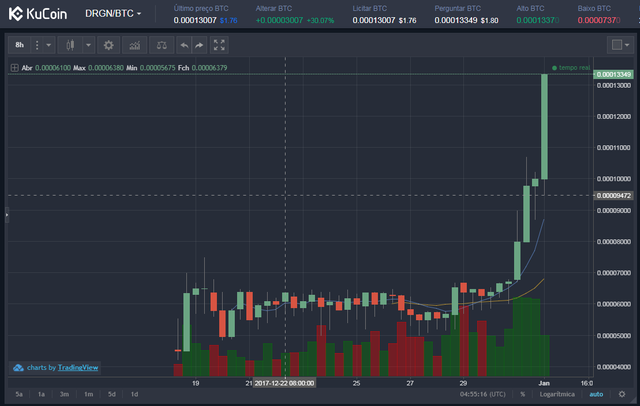 Let me just tell you that it has been mooning for the past several hours and it just hit its all time high a few minutes ago. Lets watch this one closely ! If you are looking to get in the action and buy some Dragons (DRGN) I know https://www.kucoin.com has btc pairs that you can trade. Please use the invitation code 1d8uP and happy trading! Another interesting coin... thanks for sharing! What?! Disney Seattle? Disney blockchain? Have I been living under a rock?! Thanks for this informative post!